Your customers may be flat out ignoring your latest news, offers and ads. Don’t blame them. It’s human nature. Take a quick look at your surroundings — your cubicle, your office, your solarium — wherever you’re reading this. How much do you notice what’s around you? I mean…really notice? 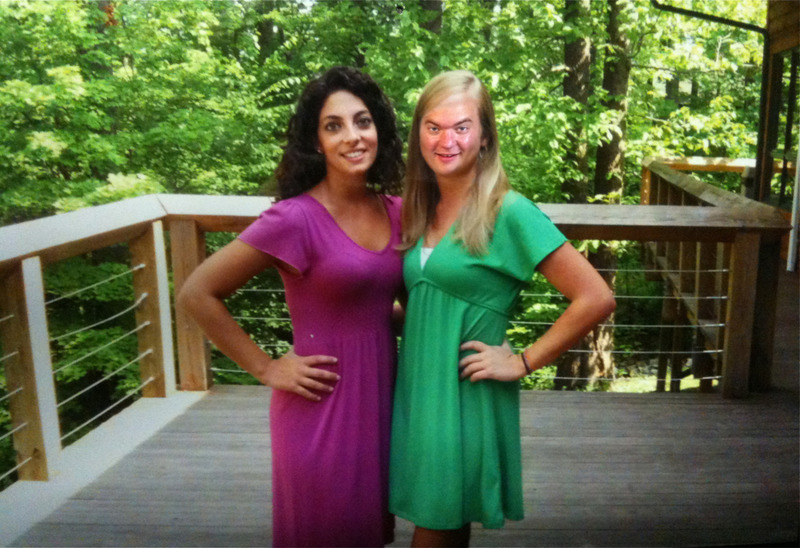 Adam Photoshopped a picture of one of our Research Analysts, Ashley, posing with a friend. It’s the picture in this blog post. Perhaps it looks normal at first glance, but if you take a closer look, you can see that the blonde woman on the right looks a little, well, masculine. That’s because Adam Photoshopped the face of a male Research Analyst over the face of Ashley’s female friend. He then replaced the photo she had hanging in her cubicle with this photo. Now I don’t want to throw Ashley under the bus. I fully admit, I’m no better (and neither are you…or our customers). For example, we recently moved the official offices of MarketingSherpa from Rhode Island to right here in Jacksonville Beach, Florida. I’ve been very cognizant of the need to look for where changes of that address need to be made on our many Web properties. But I didn’t notice that the change wasn’t made on the MarketingSherpa Twitter page – even though I look at it at least five times a day. However, when I was interviewing Ryan Amirault, Digital Marketing Manager, Whole Foods Market, for his case study at Email Summit 2012, he instantly noticed the location and started talking about Rhode Island. What we’re really talking about when we say “banner blindness” is a phenomenon scientists refer to as “inattentional blindness” or “selective attention.” The typical person is overloaded with visual stimuli and inputs of all sorts, making it simply impossible to focus on everything. So, people often overlook things that are right in front of their face. Now, I may have already primed you to see the gorilla in the above video. However, when Daniel Simons of the University of Illinois at Urbana-Champaign, and Christopher Chabris of Harvard University ran this test, they found that, in most test subject groups, 50% of the subjects did not report seeing the gorilla. How can you get your customers to see your ads? Easy, big fella. You need not become a carnival barker to grab your audience’s attention. All I want to draw your attention to is the fact that what is obvious to you (since you likely eat, sleep, and breathe your marketing message) is not always readily apparent to your audience. And don’t take for granted that your message got across just because you put it at the top of your homepage. Here is an example from the MarketingSherpa site. There is a clear contrast between the ad and its surroundings, thanks to the different color, the bright visual, and even in how “Reserve Your Seat” interrupts the “Limited seating still available” rectangle (please note, it comes out a little brighter on the screen than it does on the screen capture below). –A Multichannel Approach: Don’t think that just placing a message at the top of your homepage, smack dab in the middle (especially in a similar font as its surroundings), is enough to get your message across. I’ve made this mistake myself before. “What do you mean we didn’t tell people? It’s right there at the top of the homepage.”Most people won’t even see it. Especially if they visit your site often. That doesn’t mean you can’t put your message there, it just means to reach your potential customers in as many ways as possible with the message – email, social media, dedicated landing pages, offline communications – and not take for granted that the message was received just by placing it on your homepage. –Get in the Middle: There are certain areas of webpages that most people usually relegate to background noise – the top and bottom headers, the right and left columns. When placing an ad, or putting information on your own site, try to get right into the middle of the content. If you aren’t able to, try to make sure your information is at least at a natural stopping point for the content — for example, just to the right of or below the end of a blog post or article. –Break out of the Box: Many marketers place information in a box on their homepages or landing pages that doesn’t necessarily need to be in that box … and therefore their audience is overlooking it. From a headline on a homepage that is placed in a box (and therefore ignored) to testimonials that look like text-based ads, this mistake is all too common. When you’re on your own website, make sure you are not inadvertently making important information look like a banner ad that will be — you guessed it — totally overlooked by your visitors. Thanks, Daniel. That was really cool. Unfortunately, I wasn’t able to take the gorilla test fairly, so I saw it … but if I hadn’t been warned, I probably would have failed. I always try and get my clients to post important information in several places on a page and on their sites. This just confirms it. Again thanks for the great pointers. I’ve seen many websites who put their most important content in a box, thinking it will give more notice-ability. When you scan a web page you tend to ignore what is in the box. I always find eye catching images really grab the audience combined with little text, people want to get the information quickly without having to read big bulks of text. Unfortunately..banner blindness, comes after years of crap on the internet…you can no longer surf the internet, unless your brain filters out this crap. I’m exciting by companies such as Chango – Search Retargeting. Which may eventually change the nature of Display Advertising…it seems that Google is going this route..via its privacy setting changes. Its hard to believe but one day –display networks are going to look like search… Your search will follow you!. The concept blew me away. It’s to early to tell..but I think Marketing Experiments should test if this stuff really works..or is vaporware. The advertisement should be really interesting and catchy. Only then it can manage to attract the attention of the users. A banner should also be located on an appropriate highly specific page. That means a banner to sell a golf book would work best on a golf website/forum, etc. Many times I see all kinds of banners that not only I don’t look at but actually are boring and repelling because they’re not what the visitor is expecting to see.